The rise in electric vehicle usage is fast approaching and with that the demand for batteries is increasing. More and more governments are committing to phasing out vehicles burning oil products and investment in new battery technologies continues apace For example China’s New Energy Vehicle Mandate Policy of Sept 2017 and California’s ZEV ( Zero emission vehicle). Recent significant announcements from the world’s major automakers to boost production of hybrid and fully electric vehicles complement this global drive to legislate for more rapid and intensive take up of emissions-free transportation. Cobalt, lithium , Nickel along with rare earth elements have been identified as key strategic minerals in this rapidly expanding market. Supply of each must be increased substantially over the coming years to match predicted demand. This is precisely where Cadence is focused, particularly on mining projects that are both low-cost and scalable. We have witnessed continued consolidation in the Lithium space , along with institutional and strategic involvement in a number of assets and projects Cadence was early to identify. Lithium’s importance has been highlighted at the political and legislative level globally. Our principal investments now include stakes in Bacanora Minerals, European Metals Holdings, Macarthur Minerals, Yangibana North Project , Clancy , San Luis stakes in Argentina and Auroch Minerals. The sale of part of our stake in Bacanora was a strategic decision centered on reinvestment. Cadence will redeploy some of the profits in other early-stage mineral exploration companies where we can both hold larger stakes and add our considerable mining and financial management expertise. This will provide us with an opportunity to achieve returns of a similarly high level to those made on our Bacanora investment to date. Cadence continues to have great confidence in Bacanora Minerals and its management team, and we look forward to being a supportive shareholder and joint-venture partner in the development of the Sonora Lithium Project. We believe that Sonora has the potential to be a significant producer of battery-grade lithium carbonate, forming an important part of the global lithium-compound supply chain in the coming years. The board and Cadence’s strategy have evolved significantly since the company took a stake in Bacanora four years ago. We have begun to take an active role in management of the companies in which we invest. Cadence’s future prospects are growing and are very exciting. We will continue to support our investee companies and identify new areas for expansion that offer the potential for superior returns on capital. – Supporting existing projects through to production. – Evaluation of the investment potential in other key metals used widely in the rapidly expanding energy-storage sector, such as cobalt, copper and nickel. In this regard, we see added value in acquiring stakes in assets that are currently unlisted but fit our investment criteria, an approach which has to date delivered excellent returns. In this way we will provide our shareholders access to assets that have the same fundamentals as prior investments offerring potentially higher returns. We continue to view the medium and long term prospects for the Company with confidence. The directors would like to take this opportunity to thank our shareholders, staff and consultants for their continued support. Our focus in 2017 was to continue our investment strategy, that is, to identify, invest and play an active role in the development and progress in assets and companies that have unique access to projects that have the right chemistry, are low cost and represent a value investment. Cadence typically invests at the early stage of the resource development cycle. This can be as early as target delineation and up to scoping study level. The risk associated with investing in any resource projects at an early stage is high particularly within the lithium sector, which is not commoditised and the success or failure of a project is highly dependent on the metallurgical risks. Our approach to mitigate this risk is to obtain a deep fundamental understanding of the resource, its chemistry and management team. By doing so we can eliminate the many potential investments that we review during the year and fund projects that we believe will come to production and deliver value to our shareholders. Importantly we also take an active approach to our investments by either being part of the management team or, if not, assisting incumbent management in their endeavours. This approach has led to good absolute return figures which at the end of the financial year stood at 119% for our public listed investments and around 121% inclusive of our non listed investments. The mark market valutions of all our investments, inclusive of our portions of joint ventrures stood at some £33 million, while the valution of our public assets stood at £24.8 million (table 1). The primary driver for the increasing demand in lithium and lithium compounds is the penetration of electric vehicles (“EV”). 2017 was the year that dramatically changed the EV industry. Several prominent countries announced mandatory EV adoption rates. Many car companies from the U.S. to China to Europe announced new EV cars or at times introduced plans to electrify their entire fleet. Examples of this include, GM’s commitment of at least 20 new EVs by 2023, Mercedes announcing that it will electrify its entire line up by 2022, VW announcing to invest $84 billion to bring 300 new EV models to the market by 2030 and the most aggressive target by Volvo who announced that all of their new models will be EV by 2019. Looking back at how lithium prices performed in 2017, it’s clear that prices remained strong throughout the year with CIF in Asia for 99% Lithium Carbonate increasing from US$15,500 per tonne at the beginning of the year to US$20,750 at the end of the year. This was a surprise to a lot of commentators, however given the positive moves from the demand curve and the disappointments in the supply curve it became inevitable that we would see upward movement in prices. In the early part of 2018 we saw several negative forecasts for pricing, based erroneously on the “wave” of supply from SQM and several other assets forecast to come online, these analysts still fail to understand the industry. In making this forecast they have applied some of the most optimistic factors to construction and commissioning and applied a linear approach to growth curves, which for a disruptive technology such as EV’s is inappropriate. Our forecast suggests that there could be up to 800kt lithium compound demand by 2025. The big caveat to this is that supply comes online in time and projects gett financed. It is the latter point that Cadence sees as the largest constraint to EV adoption. In essence there is a pipeline of project which would allow the penetration of EV’s of 25%, however the large majority of these do not have financing in place, by our estimates there is some US$8 billion to be invested to hit production targets and in addition given the timelines to production it seems unlikely that there will be enough supply to deliver 800kt of lithium per annum by 2025, which will mean continued supply constraints. We continue to see plenty of evidence demand growth, Benchmark Mineral Intelligence is now tracking 26 battery mega-factories, up from just three back in 2014. The combined planned capacity of these plants is 344.5 GWh. To put that into perspective, total lithium-ion cell demand in 2017 is estimated at 100 GWh. Looking ahead to 2018, supply constraints look set to continue as the lithium demand forecast rises. In terms of demand, analysts agree that the lithium space will be led by battery production. Cadence still maintains its belief that lithium prices will remain strong and anticipates that this pattern will continue for the foreseeable future. We believe that the assets that we have invested in will form part of the medium-term lithium supply chain from 2020 onwards. Cadence holds an interest in Bacanora through a direct equity holding of approximately 8%, and a 30% stake in the joint venture interests in each of Mexalit S.A. de CV and Megalit S.A. de CV. Mexalit forms part of the Sonora Lithium Project. Bacanora is a London-listed lithium asset developer and explorer (AIM: BCN). Bacanora’s has two key projects under development. The first is the Sonora Lithium Project in Northern Mexico and the second is the Zinnwald Lithium Project in southern Saxony, Germany. On April 10th, 2017, Bacanora announced that it had entered into a strategic partnership with Hanwa Co. Ltd. (“Hanwa”), a leading Japan-based global trading company and one of the larger traders of battery chemicals in Japan, with reported net sales of more than ¥1,000 billion in 2016. Hanwa was awarded an off-take agreement for up to 100% of Bacanora’s stage 1 production of the lithium carbonate (“Li2CO3”) produced at the Sonora Lithium Project at market price at the time. Hanwa also acquired a 10% equity stake in Bacanora by purchasing 12,333,261 of the Company’s common shares and has an option to increase its interest up to 19.9%. On October 20th, 2017, Bacanora announced that the Environmental Impact Statement, the Manifestacion de Impacto Ambiental (“MIA”), for its flagship Sonora project has been approved by SEMARNAT, the Environment Ministry of Mexico. The approval represents a major milestone for Bacanora as it grants Bacanora the governments’ approval to construct an open pit mine and a large-scale beneficiation processing facility at Sonora. On December 12th, 2017, Bacanora announced the results of the Feasibility Study (“FS”) for Sonora prepared in accordance with National Instrument 43-101 – Standards of Disclosure for Mineral Projects (“NI 43-101”). The results of the FS confirm the positive economics and favourable operating costs of a 35,000 tonnes per annum (“tpa”) battery grade lithium carbonate (“Li2CO3”) operation. o Life of Mine (“LOM”) operating costs of US$3,910/t Li2CO3. Both the equity stake in Bacanora and our ownership in the Mexalit joint venture could represent a substantial return for Cadence in the form of cash flow from the Sonora Lithium Project. On 21 February 2017 Bacanora announced the acquisition of a 50% interest in, and joint operational control of, the Zinnwald Lithium Project in southern Saxony, Germany from SolarWorld AG. Bacanora holds 50% interest in a jointly controlled entity, Deutsche Lithium GmbH, which operates the Zinnwald Project located in southern Saxony, Germany, adjacent to the border of the Czech Republic and within 5 kilometres of the towns of Altenberg and Freiberg. The Company acquired its interest in February 2017 for a cash consideration of €5 million and an undertaking to contribute up to €5 million toward the costs of completion of a feasibility study, which is anticipated to be completed during the second quarter of 2019. Bacanora has an option to acquire the remaining 50% of the jointly controlled entity, alone or together with any reasonably acceptable third party within a 24-month period for €30 million. In the event that Bacanora does not exercise this right within the above stated timeframe, then SolarWorld has the right but not the obligation to purchase the Company’s 50% interest for €1. Deutsche Lithium represents a strategic asset located in close proximity to a thriving market for lithium and energy products, which is being fuelled by Germany’s electric automotive industry and the rise of renewable energy storage. Zinnwald is located in a world-class granite hosted Sn/W/Li belt that has been mined historically for tin, tungsten and lithium at different times over the past 300 years. The project has a historical resource estimate which was reported in accordance with the PERC Code1, comprised of Measured, Indicated and Inferred Resources. A Qualified Person (under NI 43-101) has not done sufficient work to confirm the historical estimate; hence the Company is not treating the historical estimate as current Mineral Resources or Mineral Reserves. demonstrates its potential for economic extraction of lithium products, as well as potential by-products of tin, tantalum and SOP. Bacanora’s investment and expertise will facilitate further development in order to achieve higher-value, downstream lithium products which command higher prices in the market. A resource infill drilling programme to upgrade the existing resource model in accordance with NI 41-101 has now been completed. Collection of a 100 tonne bulk ore sample from the legacy mine at Zinnwald to provide samples for metallurgical testwork has also been completed. On completion of the concentration testwork, hydrometallurgical testwork for downstream processing will be undertaken, focusing on the production of higher value lithium battery chemical products. Deutsche Lithium has been granted a mining licence covering 256.5 hectares of the Zinnwald project.The 30 year mining licence has been issued by the Saxony State Mining Authority. Subsequent to the transaction SolarWorld filed for bankruptcy protection in Germany due to ongoing pricing pressures in its core solar markets. The Company is confident that the SolarWorld insolvency process will have no material impact on the Company’s interest in Deutsche Lithium and the Zinnwald project. Cadence owns approximately 8% of Bacanora. The Sonora Lithium Project is comprised of the following lithium properties. La Ventana, La Ventana 1, and Megalit concessions, which are 100 percent owned by Minera Sonora Borax S.A. de C.V.(“MSB”), a wholly-owned subsidiary of Bacanora; Cadence, through its approximate direct interest of 8% of Bacanora, has an indirect interest in these concessions of 8%. El Sauz, El Sauz 1, El Sauz 2, Fleur and Fleur 1 concessions, which are held by Mexilit S.A. de C.V. (“Mexilit”). Cadence has a 30% direct interest in Mexalit through its Joint Venture with Bacanora, and when combined with Cadence’s direct interest of approximately 8% in Bacanora, has a total economic interest in Mexalit of 35%. Cadence also owns a 30% direct interest in The Megalit, Buenavista, and San Gabriel concessions, which are held by Megalit S.A de C.V (“Megalit”) which when combined with Cadences’ direct interest of approximately 8% in Bacanora, has a total economic interest in Megalit of 35%.These areas are not part of the mining plans of the Sonora Lithium Project and have not been assessed in sufficient detail to provide a 43-101 compliant Mineral Resource Estimate. Cadence has been investing in EMH since June 2015 and continued to do so during the period. It currently owns approximately 20% in the Cinovec deposit in the Czech Republic through a direct holding in the share capital of European Metals Holdings Limited that owns 100 per cent of the exploration rights to the Cinovec lithium/tin deposit. The Cinovec lithium and tin deposit is located in the Krusne Hory mountain range. The deposit that straddles the border between Germany and the Czech Republic and in Germany, it is known as the Zinnwald deposit (50% owned by Bacanora). The district has an extensive mining history, with various metals having been extracted since the 14th Century. European Metals made significant progress during the year. With the Company’s efforts focusing on the completion of a pre-feasibility study (“PFS”). This was announced in April 2017 and confirmed the potential that the Cinovec deposit could be developed into a low-cost producer of lithium products. Project development for the year was centered on a significant drilling program embarked upon by the Company. There were numerous updates to this program released to the market during the period. Overall, results from the program either confirmed or exceeded expectations with respect of both lithium content and width of mineralisation. In November 2016, the Company announced a significant increase in the indicated resource at Cinovec. This upgrade was a result of the drilling program to that point and increased the indicated resource by approximately 420%. In June 2017, and based on the PFS taken on the Cinovec Project, European Metals declared a maiden Probable Ore Reserve of 34.5 Mt @0.65% Li2O. This drilling program provided important data to the Company’s Preliminary Feasibility Study (“PFS”) which was ongoing throughout the period. The Company released various updates with regards to this study throughout the year, and the completion at the end of March 2017. Highlights of the work program for the PFS included a significant reduction of pre-production capital costs and outstanding recoveries, and the successful manufacture of >99.5% pure lithium carbonate using an industry proven, sodium sulphate roast-based flow-sheet. Since the completion of the PFS European Metals has been embarking on elements of the Definitive Feasibility Study, including the appointments a DFS manager, further optimisation testwork on the metallurgy and further increases in indicated resource figures. European Metals is now progressing its permits, environmental studies and the BFS and we look forward to 2018 and the progress that will be made to bring this asset into production. Cadence owns a direct interest of approximately 20% of European Metals. In December 2017 Cadence Minerals announced that it had executed binding investment agreements wto acquire up to 100% of six prospective hard rock lithium assets in Argentina. These transactions mark the start of the Company’s strategic shift to earn in to early stage lithium assets in well-known lithium jurisdictions where we see the potential to deliver shareholder value by investing in projects that have shorter development timeline to cashflow than a typical lithium carbonate producer. 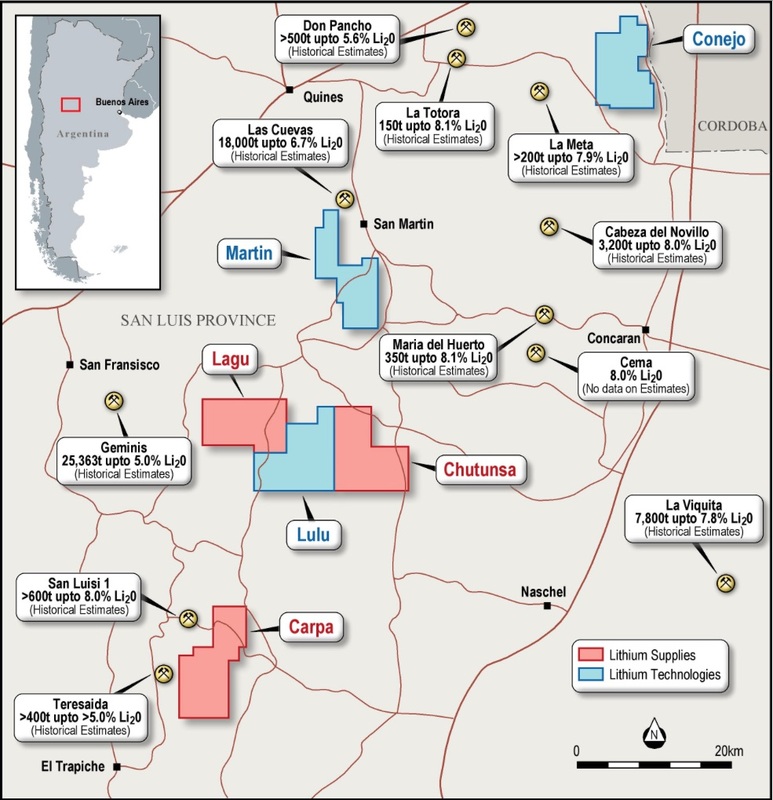 The San Luis Project Consist of claims over 55,773 hectares for six exploration permits within the known spodumene bearing pegmatite fields in San Luis Province, Central Argentina. The pegmatite fields of San Luis have an important past record of producing mica, beryl, spodumene, tantalite (tantalum oxide), columbite (niobium oxide), and recently potassium feldspar, albite and quartz. Historic mines outside of the claims have produced lithium oxide (“Li2O”) at grades ranging from 4.5% to 6.5%. On grant of the exploration permits Cadence will acquire up to 49% by spending £1.1m on exploration and drilling, and by issuing £0.4 million of new ordinary shares in Cadence to The Vendors. Cadence has an option to acquire up to 100% by issuing a further £1.75m of new ordinary shares in Cadence. Subsequent to the year-end, remote exploration has begun on the assets, including geophysical, remote mapping and historic data collection. We anticipate publishing these results over the coming weeks. Once the exploration licenses are granted we can progress with the field mapping and drilling with the aim of delivering a maiden ore resource. In September 2017 Cadence announced that Clancy’s investigations into its tenure determined that there were 28 overlapping licences out of Clancy’s 200 licences that were preceding priority claimants (‘Preceding Claims’). These Preceding Claims cover a total area of approximately 12km2 and included the historical Nockelberg and Leogang mines. Clancy continues to have priority over the balance of the project area, being 172 licences covering approximately 68km2 (‘Remaining Licenses’). Prior to the investigations, Cadence acquired a 10% interest (refer to ASX release dated 3 July 2017) in all 200 licences held by Clancy, and the parties entered into a joint venture. Cadence was subsequently made aware of the licensing situation and we agreed with Clancy to continue to evaluate the Remaining Licenses, in which Cadence holds 10%. Furthermore. the board of Clancy, in discussions with Cadence, have considered it appropriate to issue Cadence 140,000,000 fully paid ordinary shares at a deemed price of $0.003 (‘Clancy Shares’) as compensation for the discovery of third party priority over the 28 overlapping licenses (including the historical Nockelberg and Leogang mines). Since December 2011 Cadence has owned a 30% interest in the Yangibana rare earth project situated in the Gascoyne region of Western Australia. Cadence’s interest is free carried up to the commencement of the bankable feasibility study on Yangibana. Hastings Technology Metals Limited is the manager of the Project and holds a 70% interest. Hastings continued to explore and develop the Yangibana project during the year. Hastings continued to develop the Yangibana project as a whole (inclusive or areas outside our interest) with the publictions of the Yangibana Definitive Feasibility Study published in November 2017. This study did not include any material mined from the joint venture with Hastings. Discussions with management have determined that given the mineralogy of the deposit on the joint venture areas, processing of the ore prior to the ten years contemplated in the Definitive Feasibility Study would reduce the economics of the project as a whole there it has been excluded, it has yet to be determined if the joint venture areas would form part of the twenty year mine plan. In March 2016 Cadence Minerals made a strategic investment in Macarthur (TSX-V: MMS) and now currently holds approximately 15% of Macarthur. Macarthur has made progress on several fronts during the year. During the period Macarthur has been active in the development of its Gold exploration business. Securing options over or applications over several prospective gold properties in Western Australia. The most significant of which appears to be the Hillside Gold Project. The Hillside Gold Project encompasses Exploration Licence Applications E45/4824, E45/4708 and E45/4709 held by Macarthur Lithium Pty Ltd, a wholly owned subsidiary of Macarthur Minerals. Macarthur has also entered into an option agreement to acquire Exploration Licence E45/4685, which immediately adjoins the tenements of the Hillside Gold Project. This group of tenements are located approximately 185 kilometres (“km”) South East of Port Hedland and 50 km South West of Marble Bar (the “Hillside Gold Project”). The Hillside Gold Project is highly prospective for gold and copper. The area has previously been explored by various companies for gold, copper, zinc and lead but limited drilling exists. Historical rock chip sampling by Great Southern Mines in 1998 returned 37 samples grading above one gram per tonne (g/t) up to a maximum of 447 g/t Au. These tenements surround the mining lease of the historic Edelwiess gold mine. A limited drilling program consisting of six rotary percussion (“RC”) holes conducted by Metana Minerals N.L in 1980 intersected gold mineralisation associated with quartz veins. Gold was recorded in three holes with an average grade of approximately 12 g/t Au and a maximum of 25.83 Au g/t. In addition, sampling along a discontinuous outcropping gossan over a strike of 18 km, showed high potential for copper mineralisation. A total of 20 results yielded above 1,000 ppm Cu to a maximum of 7.8% Cu. Macarthur recently conducted a reconnaissance field trip to the Hillside Gold Project to investigate further the highly anomalous gold results previously reported. This trip confirmed the potential for high grade gold on the Hillside Gold Project. Macarthur Minerals has 11 Exploration Licenses and 5 Exploration License Applications in the Pilbara covering a total area of approximately 1,312 km2. In prior years Macarthur completed two heliborne reconnaissance field trips across a portion of its tenements in the Pilbara region. Sampling across several pegmatites yielded encouraging results warranting further exploration. The best lithium results are from a swarm of pegmatites within Exploration Licence application E45/4702 exploited in the past for tin and tantalum. A sample of lithium muscovite from one old working returned 0.2% Li2O and elevated tantalum and tin values confirming the rare element character of this pegmatite. A feldspar-quartz-muscovite pegmatite within Exploration Licence E45/4711 also returned 111 parts per million (“ppm”) lithium (“Li”). In addition to the reconnaissance sampling, historical results of the Geological Society of WA (“GSWA”) include the Tambourah North lithium pegmatite located in Exploration Licence Application E45/4848. A rock sample collected by Fortescue Metals Group Ltd in 2012 on the western edge of Exploration Licence E45/4702 returned a result of 876 ppm Li (0.19% Li2O). On June 15, 2017 Macarthur announced that it had staked 210 new unpatented placer mining claims at its new Reynolds Springs Lithium Brine Project in the Railroad Valley, Nevada. The new claims are located near the town of Currant, in Nye County, Nevada. The Reynolds Springs Project is located approximately 180 miles (300 km) North of Las Vegas, Nevada. A total of 206 soil samples were collected across the full extent of the Reynolds Springs Project. Lithium values in the soil samples ranged from a low of 39.3 ppm to a high of 405 ppm Li. Samples were consistently high averaging 168.3 ppm Li with 85% of samples recording over 100 ppm Li and 19% greater than 200 ppm Li. These results are considered high in comparison to the majority of non-lithium producing playas and amongst the highest we have seen outside of the Clayton Valley. Macarthur Minerals’ Iron Ore Projects are located on mining tenements covering approximately 62 km2 located 175 km northwest of Kalgoorlie in Western Australia. Within the tenements, at least 33 km strike extent of outcropping banded iron formation (“BIF”) occurs as low ridges, surrounded by intensely weathered and mostly unexposed granites, basalts and ultramafic rocks. The Iron Ore Projects are situated in the Yilgarn Region of south-western, Western Australia. The Yilgarn Region is a host to many significant mineral deposits that have been or are being mined for iron ore. The tenements cover the Yeriligee greenstone belt which is some 80 km in length and lies within the Southern Cross Province of the Yilgarn. The Iron Ore Projects are approximately 107 km from the existing Eastern Goldfields Railway (located near the township of Menzies) that has a direct connection to the Port of Esperance in Western Australia, where it is intended that ore from the Projects will be shipped. Export is subject to capacity becoming available, which is not certain. The Ularring Hematite Project’s Mineral Resources are comprised of Indicated Mineral Resources of approximately 54.5 Mt @ 47.2% Fe and approximately 26Mt @ 45.4% Fe Inferred resources. The Mineral Resource estimates were prepared by CSA Global on behalf of Macarthur Minerals (N143-101 Technical Report, 20123) and reported in accordance with the JORC Code. Macarthur Minerals’ Iron Ore Projects are located on mining tenements covering approximately 62 km2 located 175 km northwest of Kalgoorlie in Western Australia. Within the tenements, at least 33 km strike extent of outcropping banded iron formation (“BIF”) occurs as low ridges, surrounded by intensely weathered and mostly unexposed granites, basalts and ultramafic rocks. Cadence owns a direct interest of approximately 7% of Auroch. Auroch is an Australian ASX listed company which during the year focused on the development of three prospective, lithium, copper and cobalt assets. After the year-end Auroch terminated or decided not to pursue these projects further. o The Bonaventura Project has several high-grade zinc (base-metal) and gold targets that are drill-ready. During the year Cadence reduced it licenses’ exposure to 1 in Greenland, of which it owns 100%. This licenses abuts the northern and eastern boundaries of Greenland Minerals and Energy Limited’s ‘GGG’ licences that encompass the world-class Kvanefjeld, Sørenson, Zone 3 and Steenstrupfjeld Rare Earth Element (REE) deposits. An extensive exploration programme was carried out on all of Cadence’s exploration licences in south Greenland from June to August 2014. We have continued to review these licenses on an annual basis. We will continue to review these licenses on an annual basis, and will monitor the progress that GGG makes over the coming year as it progresses the Kvanefjeld REE deposits. During the period the Group made an operating profit of £2.51 million (2016: £2.84 million). This slight decrease was due to a £300,000 impairment on our Greenland investment (2016: nil). Total comprehensive profit for the year attributable to equity holders was £1.88m (2016: £0.13m). This increase is mainly due to reduced finance costs (approximately£1m reduction for the period) and favourable foreign exchange (approximately £1m increase for the period). Diluted earnings per share were 0.013p (2016 : 0.007p).). Administrative costs decreased by approximately 30% for the period to £1.80m (2016: £2.22m). We anticipate to be able to deliver further cost savings in the coming year. Subsequent to the year end, Directors cash remuneration reduced on average by some 28%. The net assets of the Group increased to £26.72 million at 31 December 2017 (2016: £24.53 million). This was driven by the part repayment of the convertible loan note and the increase in value of available for sale investments. During the period our net cash outflow from operating activities was £2.06 million (2016: £1.83m). We had a net inflow from our investing activities of £6.29m, associated with the sale of part of our available sale investments, in particular our sale of just under 50% of our stake in Bacanora Minerals. These receipts were used to pay back some of the convertible loan notes, which resulted in a net cash outflow from financing activities of £6.34 million. As a result of the above we had a net reduction in cash and cash equivalents of £2.16 million for the period and cash equivalents of £2.04 million at the end of the period. The Directors present their annual report together with the audited consolidated financial statements of the Group and the Company for the Year Ended 31 December 2017. The principal activity of the Group and the Company is that of the identification, investment and development of Lithium and rare earth assets. The Group is also exploring other mining related opportunities. Cadence Minerals plc is domiciled in the United Kingdom, which is also its principal place of business. The results of the Group are shown on in this report. The directors do not recommend the payment of a dividend. A review of the performance of the Group and its future prospects is included in the Chairman’s Statement and the Strategic Report within this report. Due to the current status of the Group, the Board has not identified any performance indicators as key. The principal risks and uncertainties facing the Group involve the ability to raise funding in order to finance the acquisition and exploitation of mining opportunities and the exposure to fluctuating commodity prices. In addition, the amount and quality of minerals available and the related costs of extraction and production represent a significant risk to the group. The Group’s principal financial instruments are available for sale assets, trade receivables, trade payables, loans and cash at bank. The main purpose of these financial instruments are to fund the Group’s operations. It is, and has been throughout the period under review, the Group’s policy that no trading in financial instruments shall be undertaken. The main risks arising from the Group’s financial instruments are liquidity risk and interest rate risk. The board reviews and agrees policies for managing each of these risks and they are summarised below. The Group’s objective is to maintain a balance between continuity of funding and flexibility through the use of equity and its cash resources. Further details of this are provided in the principal accounting policies, headed ‘going concern’ and note 17 to the financial statements. The Group only has borrowings at a fixed coupon rate of 10% and therefore minimal interest rate risk, as this is deemed its only material exposure thereto. The Group seeks the highest rate of interest receivable on its cash deposits whilst minimising risk. The Group is subject to market risk in relation to its investments in listed Companies held as available for sale assets. The membership of the Board is set out below. All directors served throughout the period unless otherwise stated. It is the Group’s policy to agree appropriate terms and conditions for its transactions with suppliers by means ranging from standard terms and conditions to individually negotiated contracts and to pay suppliers according to agreed terms and conditions, provided that the supplier meets those terms and conditions. The Group does not have a standard or code dealing specifically with the payment of suppliers. Trade payables at the year end all relate to sundry administrative overheads and disclosure of the number of days purchases represented by year end payables is therefore not meaningful. Events after the Reporting Period are outlined in Note 20 to the Financial Statements. The Directors have prepared cash flow forecasts for the period ending 31 May 2019 which take account of the current cost and operational structure of the Group. The cost structure of the Group comprises a high proportion of discretionary spend and therefore in the event that cash flows become constrained, costs can be quickly reduced to enable the Group to operate within its available funding. These forecasts demonstrate that the Group has sufficient cash funds available to allow it to continue in business for a period of at least twelve months from the date of approval of these financial statements. Accordingly, the financial statements have been prepared on a going concern basis. – prepare the financial statements on the going concern basis unless it is inappropriate to presume that the Group will continue in business. The Directors are responsible for keeping adequate accounting records that are sufficient to show and explain the Group’s transactions and disclose with reasonable accuracy at any time the financial position of the Group and enable them to ensure that the financial statements comply with the Companies Act 2006. They are also responsible for safeguarding the assets of the Group and hence for taking reasonable steps for the prevention and detection of fraud and other irregularities. the Directors have taken all steps that they ought to have taken to make themselves aware of any relevant audit information and to establish that the auditors are aware of that information. Chapman Davis LLP, offer themselves for re-appointment as auditor in accordance with Section 489 of the Companies Act 2006. The Group supports the concept of an effective board leading and controlling the Group. The Board is responsible for approving Group policy and strategy. It meets on a regular basis and has a schedule of matters specifically reserved to it for decision. Management supply the Board with appropriate and timely information and the Directors are free to seek any further information they consider necessary. All Directors have access to advice from the Company Secretary and independent professional advice at the Group’s expense. The Board consists of four Directors, who hold the key operational positions in the Company. The Chairman of the Board is Andrew Suckling and the Group’s business is run by the Chief Executive, Kiran Morzaria. The Company values the views of its shareholders and recognises their interest in the Group’s strategy and performance. The Annual General Meeting will be used to communicate with private investors and they are encouraged to participate. The Directors will be available to answer questions. Separate resolutions will be proposed on each issue so that they can be given proper consideration and there will be a resolution to approve the annual report and financial statements. The Board is responsible for maintaining a strong system of internal control to safeguard shareholders’ investments and the Group’s assets. The system of internal financial control is designed to provide reasonable, but not absolute, assurance against material misstatement or loss. The Board has considered the need for an internal audit function but has decided the size of the Group does not justify it at present. However, it will keep the decision under annual review. Audit and Remuneration Committees have been established. The Audit committee comprises Adrian Fairbourn (Chairman), Donald Strang, and Andrew Suckling, and the Remuneration Committee comprises Adrian Fairbourn (Chairman) and Andrew Suckling. The role of the Remuneration Committee is to review the performance of the executive Directors and to set the scale and structure of their remuneration, including bonus arrangements. The Remuneration Committee also administers and establishes performance targets for the Group’s employee share schemes and executive incentive schemes for key management. In exercising this role, the terms of reference of the Remuneration Committee require it to comply with the Code of Best Practice published in the Combined Code. The Audit Committee is responsible for making recommendations to the Board on the appointment of the auditors and the audit fee, and received and reviews reports from management and the Company’s auditors on the internal control systems in use throughout the Group and its accounting policies. The Board recognises that Directors’ remuneration is of legitimate concern to the shareholders. The Group operates within a competitive environment, performance depends on the individual contributions of the Directors and employees and it believes in rewarding vision and innovation. The policy of the Board is to provide executive remuneration packages designed to attract, motivate and retain Directors of the calibre necessary to maintain the Group’s position and to reward them for enhancing shareholder value and return. It aims to provide sufficient levels of remuneration to do this, but to avoid paying more than is necessary. The remuneration will also reflect the Directors’ responsibilities and contain incentives to deliver the Group’s objectives. (1) Share based payments represent a Black and Scholes valuation of the incentive options granted to the directors during the year. Options are used to incentivise directors and are a non-cash form of remuneration. At 31 December 2017 the following amount was outstanding in fees to directors; £138,000 (2016: £150,000). The company only operates a basic pension scheme for its directors and employees as required by UK legislation. No benefits in kind were paid during the year to 31 December 2017 or the year ended 31 December 2016. No amounts were payable for bonuses in respect of the Year ended 31 December 2017 or the year ended 31 December 2016. Andrew Suckling, Kiran Morzaria, Don Strang and Adrian Fairbourn, each have a 12 month rolling notice period. Additionally the option holder must have made market purchases of ordinary shares equal to a total of one third of the Option Holders’s annual salary or particpated in a Company share purchase programme for a period of at least six months prior to the grant date. All options are exercisable between 18 months and ten years from the date of grant. The high and low share price for the year were 0.60p and 0.249p respectively (year ended 31 December 2016: 0.925p and 0.404p). The share price at 31 December 2017 was 0.315p (31 December 2016: 0.5p). We have audited the financial statements of Cadence Minerals Plc (the ‘Parent Company’) and its subsidiaries (the ‘Group’) for the year ended 31 December 2017 which comprise the consolidated statement of comprehensive income, the consolidated and company statements of financial position, the consolidated and company statements of changes in equity, the consolidated and company statements of cash flows and notes to the financial statements, including a summary of significant accounting policies. The financial reporting framework that has been applied in the preparation of the company financial statements is applicable law and International Financial Reporting Standards (IFRSs) as adopted by the European Union. the financial statements have been prepared in accordance with the requirements of the Companies Act 2006. We conducted our audit in accordance with International Standards on Auditing (UK) (ISAs (UK)) and applicable law. Our responsibilities under those standards are further described in the Auditor’s responsibilities for the audit of the financial statements section of our report. We are independent of the Group in accordance with the ethical requirements that are relevant to our audit of the financial statements in the UK, including the FRC’s Ethical Standard, and we have fulfilled our other ethical responsibilities in accordance with these requirements. We believe that the audit evidence we have obtained is sufficient and appropriate to provide a basis for our opinion. the directors have not disclosed in the financial statements any identified material uncertainties that may cast significant doubt about the Group’s or the parent company’s ability to continue to adopt the going concern basis of accounting for a period of at least twelve months from the date when the financial statements are authorised for issue. Key audit matters are those matters that, in our professional judgement, were of most significance in our audit of the financial statements of the current period and include the most significant assessed risks of material misstatement (whether or not due to fraud) that we identified. These matters included those which had the greatest effect on: the overall audit strategy, the allocation of resources in the audit; and directing the efforts of the engagement team. These matters were addressed in the context of our audit of the financial statements as a whole, and in forming our opinion thereon, and we do not provide a separate opinion on these matters. This is not a complete list of all risks identified by our audit. Our audit procedures in relation to these matters were designed in the context of our audit opinion as a whole. They were not designed to enable us to express an opinion on these matters individually and we express no such opinion. We have determined the matters described below to be the key audit matters to be communicated in our report. The Group’s Available for Sale Investment assets (‘AFS assets’) represents one of the most significant asset on its statement of financial position totalling £13.5m as at 31 December 2017, all of which includes listed investments. The carrying value of AFS assets represents significant assets of the Group and Parent Company, and assessing whether facts or circumstances exist to suggest that impairment indicators were present, and if present, whether the carrying amount of these asset may exceed its recoverable amount was considered key to the audit. This assessment involves significant judgement applied by management to the Group and Parent Company’s listed investments. We considered it necessary to assess whether facts and circumstances existed to suggest that impairment indicators were present, and if present, whether the carrying amount of these assets may exceed its recoverable amount. Expiring, or imminently expiring, rights to licences or assets held by the investee Companies. A lack of flow of information in regards to the investee companies exploration activities and/or production, trading or strategic advancement. Discontinuation of, or a plan to discontinue, exploration activities in the areas, or cessation or delays in trading of interest by the Investee Companies. Sufficient data exists to suggest carrying value of exploration and evaluation assets is unlikely be recovered in full through successful development or sale by the Investee Companies. Updates on trading activities by Investee Companies. We also reviewed Stock Exchange RNS announcements and Board meeting minutes for the year and subsequent to year end for activity to identify any indicators of impairment. We also assessed the disclosures included in the financial statements and our results found the carrying value for AFS assets to be acceptable. In planning and performing our audit we applied the concept of materiality. An item is considered material if it could reasonably be expected to change the economic decisions of a user of the financial statements. We used the concept of materiality to both focus our testing and to evaluate the impact of misstatements identified. Based on professional judgement, we determined overall materiality for the Group financial statements as a whole to be £310,000, based on a 1% percentage consideration of the Group’s total assets. The Directors are responsible for the other information. The other information comprises the information included in the annual report, other than the financial statements and our auditor’s report thereon. Our opinion on the financial statements does not cover the other information and, except to the extent otherwise explicitly stated in our report, we do not express any form of assurance conclusion thereon. In connection with our audit of the financial statements, our responsibility is to read the other information and, in doing so, consider whether the other information is materially inconsistent with the financial statements or our knowledge obtained in the audit or otherwise appears to be materially misstated. If we identify such material inconsistencies or apparent material misstatements, we are required to determine whether there is a material misstatement in the financial statements or a material misstatement of the other information. If, based on the work we have performed, we conclude that there is a material misstatement of this other information, we are required to report that fact. We have nothing to report in this regard. the Strategic Report and the Directors’ report have been prepared in accordance with applicable legal requirements. In the light of the knowledge and understanding of the Group and Parent Company and its environment obtained in the course of the audit, we have not identified material misstatements in the Strategic report or the Directors’ report. As explained more fully in the Directors’ responsibilities statement, the Directors are responsible for the preparation of the financial statements and for being satisfied that they give a true and fair view, and for such internal control as the Directors determine is necessary to enable the preparation of financial statements that are free from material misstatement, whether due to fraud or error. In preparing the financial statements, the Directors are responsible for assessing the Group and Parent Company’s ability to continue as a going concern, disclosing, as applicable, matters related to going concern and using the going concern basis of accounting unless the Directors either intend to liquidate the Group or Parent Company or to cease operations, or have no realistic alternative but to do so. Our objectives are to obtain reasonable assurance about whether the financial statements as a whole are free from material misstatement, whether due to fraud or error, and to issue an auditor’s report that includes our opinion. Reasonable assurance is a high level of assurance, but is not a guarantee that an audit conducted in accordance with ISAs (UK) will always detect a material misstatement when it exists. Misstatements can arise from fraud or error and are considered material if, individually or in the aggregate, they could reasonably be expected to influence the economic decisions of users taken on the basis of these financial statements. A further description of our responsibilities for the audit of the financial statements is located on the Financial Reporting Council’s website at: www.frc.org.uk/auditorsresponsibilities. This description forms part of our auditor’s report. Chapman Davis LLP is a limited liability partnership registered in England and Wales (with registered number OC306037). The accompanying principal accounting policies and notes form an integral part of these financial statements. As announced in December 2017 the Directors all entered into a Defined Director Purchase Programme (“DDPP”) in which they will each purchase £1,000 of ordinary shares per month for 12 months. These shares will be purchased from the market on the first Friday of each month starting on 2nd February 2018 and ending the 4th January 2019. The market will be notified of the purchases on the next trading day via a PDMR; Directors are dealing notification. The Directors have entered into a DDPP in an open period and under this programme are therefore committed to the purchase of shares in what otherwise may be a close period. Entering into the DDPP does not preclude the directors from buying additional shares in the Company during open periods. Cadence is dedicated to smart investments for a greener world. The planet needs rechargeable batteries on a global scale – upcoming supersized passenger vehicles, lorries and buses – require lithium and other technology minerals to power their cells. Cadence is helping find these minerals in new places and extracting them in new ways, which will meet the demand of this burgeoning market. With over GBP20 million vested in key assets globally, Cadence is helping us reach tomorrow, today. Cadence invests across the globe, principally in lithium mining projects. Its primary strategy is taking significant economic stakes in upstream exploration and development assets within strategic metals. We identify assets that have strategic cost advantages that are not replicable, with the aim of achieving lower quartile production costs. The combination of this approach and seeking value opportunities allows us to identify projects capable of achieving high rates of return. The Cadence board has a blend of mining, commodity investing, fund management and deal structuring knowledge and experience, that is supported by access to key marketing, political and industry contacts. These resources are leveraged not only in our investment decisions but also in continuing support of our investments, whether it be increasing market awareness of an asset, or advising on product mix or path to production. Cadence Mineral’s goal is to assist management to rapidly develop the project up the value curve and deliver excellent returns on its investments. As announced in December 2017 the Directors all entered into a Defined Director Purchase Programme (“DDPP”) in which they will each purchase £1,000 of ordinary shares per month for 12 months. These shares will be purchased from the market on the first Friday of each month starting on 2nd February 2018 and ending the 4th January 2019. Cadence is dedicated to smart investments for a greener world. The planet needs rechargeable batteries on a global scale – upcoming supersized passenger vehicles, lorries and buses – require lithium and other technology minerals to power their cells. Cadence is helping find these minerals in new places and extracting them in new ways, which will meet the demand of this burgeoning market. With circa £20 million vested in key assets globally, Cadence is helping us reach tomorrow, today. Further to the announcement by the Company yesterday, Andrew Suckling has recently purchased ordinary shares in the Company in the following amounts. As announced in December 2017 the Directors all entered into a Defined Director Purchase Programme (“DDPP”) in which they will each purchase £1,000 of ordinary shares per month for 12 months. These shares will be purchased from the market on the first Friday of each month starting on 2nd February 2018 and ending the 4th January 2019. The market will be notified of the purchases on the next trading day via a PDMR; Directors dealing notification. Mr Andrew Suckling did not complete his scheduled DDPP on 2 March 2018, due to an error by his broker, as such it is anticipated that this will be completed during the course of this week. Cadence Minerals #KDNC announces that the Directors of the Company have acquired 6.7 million shares in the company at an average price of 0.28 pence. In addition, all of the Directors have entered into a Defined Director Purchase Programme. Andrew Suckling, Kiran Morzaria, Donald Strang and Adrian Fairbourn have all entered into a Defined Director Purchase Programme in which they will each purchase £1,000 of ordinary shares per month for 12 months. These shares will be purchased from the market on the first Friday of each month starting on 2nd February 2018 and ending the 4th January 2019. The market will be notified of the purchases on the next trading day via a PDMR; Directors dealing notification. Cadence is dedicated to smart investments for a greener world. The planet needs rechargeable batteries on a global scale – upcoming supersized passenger vehicles, lorries and buses – require lithium and other technology minerals to power their cells. Cadence is helping find these minerals in new places and extracting them in new ways, which will meet the demand of this burgeoning market. With over £25 million vested in key assets globally, Cadence is helping us reach tomorrow, today. Cadence Minerals (AIM/NEX: KDNC; OTC: KDNCY) is delighted to inform shareholders that it has executed binding investment agreements with Lithium Technologies Pty Ltd and Lithium Supplies Pty Ltd to acquire up to 100% of six prospective hard rock lithium assets in Argentina. The Vendors have claims over 55,773 hectares for six exploration permits within the known spodumene bearing pegmatite fields in San Luis Province, Central Argentina. Initial site visit and reviews by Cadence have confirmed multiple pegmatite outcrops across the six claims. Some of these occurrences are proximate or along strike from known mineralised pegmatites that have been previously mined for lithium minerals (such as spodumene or lepidolite). The pegmatite fields of San Luis have an important past record of producing mica, beryl, spodumene, tantalite (tantalum oxide), columbite (niobium oxide), and recently potassium feldspar, albite and quartz. Historic mines outside of the claims have produced lithium oxide (“Li2O”) at grades ranging from 4.5% to 6.5%. The properties have good access and infrastructure support for exploration activities on a year-round basis. On grant of the exploration permits Cadence will acquire up to 49% by spending £1.1m on exploration and drilling, and by issuing £0.4 million of new ordinary shares in Cadence to The Vendors. Cadence has an option to acquire up to 100% by issuing a further £1.75m of new ordinary shares in Cadence. 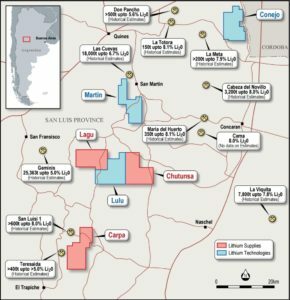 The Vendors have claims over a total of six hard rock lithium assets in San Luis Province, Central Argentina. Combined, the total area of the six assets is 55,773 hectares which delivers Cadence a large potentially mineralised footprint to ramp up exploration activities with the target of proving up a commercially viable JORC code compliant resource. There are over a dozen historic mines (mined between 1936-80) in the Sans Luis area which produced lithium oxide at grades from 4.5% to 6.5% Li2O. In recent years, assay results taken from the spodumene outcrops across the region have returned results ranging from 5% up to 8.1% Li2O. Aggregating historic estimates for the legacy mines, there is an estimated 55,000 tonnes of lithium oxide. However, with the application of modern exploration techniques, we believe that there is potentially considerable exploration upside across the six assets. No cities or lakes inside project areas which mitigates environmental issues to a large degree. The San Luis and Córdoba lithium bearing pegmatite fields belong to the Pampean pegmatite province that was defined to include the economic fields of granitic pegmatites of central and north-western Argentina. It contains more than 95% of the granitic pegmatites of the country, with mineral resources that have been mined during the past 80 years, producing most of the potassium feldspar, quartz and mica plus Be‐, Li‐, Ta‐, Bi‐ and Rb‐ bearing minerals. Of particular importance for hard rock lithium exploration are those pegmatite districts located in San Luis and western Córdoba. Two parallel belts of Lithium-Caesium-Tantalum (“LCT”) pegmatites are found orientated NNE-SSW. In the western belt, pegmatites are enriched with Sn, whereas in the eastern belt pegmatites are Nb-Ta rich. The Sn-enriched pegmatite bodies were exploited for cassiterite during the 1940’s. The lithium mineralisation is predominantly represented by spodumene with minor amblygonite and lepidolite. We are looking to evaluate and define the most prospective targets across the six areas. Initially, this will focus on geological mapping, mineralogical studies of exposed pegmatites and the mapping and any newly identified historical workings. We anticipate we will be able to start this in Q1 of 2018. This will be followed by an extensive sampling programme to identify any potential mineralisation, after which we can develop a drill programme with a target of identifying a JORC code compliant economic resource. Since 2015, reformist economic and political policies have placed Argentina back on the radar as a favourable investment destination: the economic landscape is improving while inflation is being tamed. Further, a US free trade deal has been negotiated, while debt issues are mostly resolved, and exchange controls eliminated, which has seen credit ratings improve. For the mining sector, the government has eliminated export taxes on metals and allowed foreign-owned mining groups to repatriate profits overseas. More recently, the government signed a mining deal with 20 provincial governors to harmonise taxes and regulations to attract mining investment away from Chile and Peru. Argentina is a growing lithium producer, and since 2015 Argentina has received more investment than any other country in the ‘lithium triangle’. It is currently the world’s third-largest producer, with at least five new projects slated to come into production over the coming years. Lithium Technologies Pty Ltd and Lithium Supplies Pty Ltd each own 100% of Argo Mining S.A (“Argo”) and Mining and Metals (S.A) (“MinMet”) respectively. On grant of the exploration permits, Argo and MinMet will become the titleholders of the exploration permits. Further details of exploration permits are outlined below. Cadence can acquire 100% of the interest in the exploration permits and will initially earn 49% via staged investments of cash spent on exploration and development and the issue of new ordinary shares in Cadence to The Vendors. Ninety percent of the cash investment and all of the share consideration is contingent on the grant to the titleholders of the exploration permits. Cadence also has a one-year option to acquire the remaining 51% of the interest in the exploration permits. Key details of transactions are contained in the table below. The vendors will retain a 1.5% net smelter royalty on products produced from the assets. The royalty will be deferred and only become payable upon the repayment of the capital and any debt associated with establishing a mineral processing facility. Lithium Technologies Pty Ltd and Lithium Supplies Pty Ltd reported a loss of A$ 31,950 and A$ 4,680 respectively for the 5-month period ending 30 November 2017.
is a fluorophosphate mineral, composed of lithium, sodium, aluminium, phosphate, fluorideand hydroxide. The mineral occurs in pegmatite deposits and is easily mistaken for albiteand other feldspars. Its density, cleavage and flame test for lithium are diagnostic.Geologic occurrence is in granite pegmatites and high-temperature tin veins. Amblygonite occurs with spodumene, apatite, lepidolite, tourmaline, and other lithium-bearing minerals in pegmatite veins. It contains about 10% lithium, and has been utilized as a source of lithium. is a well-known mineral varieties of beryl include emerald and aquamarine. Naturally occurring, hexagonal crystals of beryl can be up to several meters in size. is a black mineral group that is an ore of niobium. It has a submetallic lustre and a high density. Under the Argentine legislation, The holder of this right can explore an area during the period granted. In case of discovering mineral evidence, the holder has an exclusive right to apply for an exploitation concession. The only way to acquire an exploration permit is through an application to the proper mining authority to explore an area which is free of other mining tenements. A geological map is a graphical presentation of geological observations and interpretations on a horizontal plane. Making, or otherwise acquiring, a geological map is invariably the first step in any mineral exploration programme, and it remains an important control document for all subsequent stages of exploration and mining, including drilling, geochemistry, geophysics, geostatistics and mine planning. They allow theories on ore deposit controls to be applied and lead (hopefully) to predictions being made on the location, size, shape and grade of potential ore bodies. They are the essential tool to aid in developing 3-dimensional concepts about geology and mineralisation at all scales. a lilac-grey or rose-coloured member of the mica group of minerals. It is the most abundant lithium-bearing mineral. It is associated with other lithium-bearing minerals like spodumene in pegmatite bodies. It is one of the major sources of the rare alkali metalsrubidium and caesium. Associated minerals include quartz, feldspar, spodumene, amblygonite, columbite, cassiterite, and beryl. comprise a compositionally defined subset of granitic pegmatites; they are typically enriched with lithium caesium and tantalum. They are products of plate convergence and mountain building episodes. Most LCT pegmatites intruded metasedimentary rocks, typically at relatively low pressures and low temperatures. Lithium carbonate is an inorganic compound, the lithium salt of carbonate with the formulaLi2CO3. Lithium is extracted from primarily two sources: pegmatite crystals and lithium salt from brine pools. Lithium carbonate has many uses and is the primary lithium compound that is used in the manufacture of lithium-ion batteries. lithium oxide or lithia is an inorganic chemical compound. Lithium oxide is formed along with small amounts of lithium peroxide when lithium metal is burned in the air and combines with oxygen. Lithium oxide concentrate is produced from the mining and processing of spodumene ore.
is a group of sheet minerals that have a layered or platy texture. Micas are used in a variety of applications. Mica’s value is based on several of its unique physical properties. A pegmatite is an intrusive igneous rock composed of crystals usually larger than 2.5 cm in size. Pegmatite bodies are usually of minor size compared to typical intrusive rockbodies. Pegmatite body size is on the order of magnitude of one to a few hundred meters. Compared to typical igneous rocks they are rather inhomogeneous and may show zones with different mineral assemblages. Crystal size and mineral assemblages are usually oriented parallel to the wall rock or even concentric for pegmatite lenses. Pegmatites are the primary source of lithium either as spodumene or lepidolite. is a pyroxene mineral consisting of lithium aluminium inosilicate, and is a source of lithium. It occurs as colourless to yellowish, purplish, or lilac kunzite (see below), yellowish-green or emerald-green hiddenite, prismatic crystals, often of great size. Spodumene is an important source of lithium for use in ceramics, mobile phone and automotive batteries, medicine and as a fluxing agent. Lithium is extracted from spodumene by fusing in acid. is a type of rock that contains sufficient minerals with important elements including metals that can be economically extracted from the rock. The ores are extracted from the earth through mining; they are then refined to extract the valuable element, or elements. is the primary source of the chemical element tantalum. It is chemically similar to columbite, and the two are often grouped together as a semi-singular mineral called coltan or “columbite-tantalite” in many mineral guides. Lithium grades are normally presented in percentages or parts per million (ppm). Grades of deposits are also expressed as lithium compounds in percentages, for example as a per cent. lithium oxide (Li2O) content or per cent. lithium carbonate (Li2CO3) content. Lithium carbonate equivalent (“LCE”) is the industry standard terminology for, and is equivalent to, Li2CO3. Use of LCE is to provide data comparable with industry reports and is the total equivalent amount of lithium carbonate, assuming the lithium content in the deposit is converted to lithium carbonate, using the conversion rates in the table included further below to get an equivalent Li2CO3 value in per cent. Use of LCE assumes 100% recovery and no process losses in the extraction of Li2CO3 from the deposit. Lithium resources and reserves are usually presented in tonnes of LCE or Li. Cadence Minerals plc, (AIM/NEX: KDNC; OTC: REMMY), which invests in highly prospective lithium and rare earth mineral projects, announces its interim results for the six months ended 30 June 2017. · Post period end: partial sale of Bacanora Minerals stake made for £6.23m and a realised return of 75%. The era of the electric vehicle is now demonstrably fast approaching. More and more governments are committing to phasing out oil-fuelled motor transport and investment in new battery technology continues apace. Recent significant announcements from the world’s major automakers to boost production of hybrid and fully electric vehicles is complementing this global drive to legislate for more rapid and intensive take up of carbon-free transport. Cobalt, lithium and rare earth elements, have been identified as key strategic minerals in this rapidly expanding market, the supply of which will have to increase substantially over the coming years. This is precisely where Cadence is focussed and particularly on mining projects that are low-cost and scalable. Our principal investments now include stakes in Bacanora Minerals, European Metals Holdings, Macarthur Minerals, Yangibana North Project and Auroch Minerals. The recent sale of part of our stake in Bacanora was a strategic decision so that we are able redeploy some of the profits for reinvestment in other early stage mineral exploration companies where we can both hold larger stakes and add our considerable mining and financial management expertise to achieve returns of a similarly high level to those made on our Bacanora investment to date. Cadence continues to have great confidence in Bacanora Minerals and its management team, and we look forward to being a supportive shareholder and joint venture partner in the development of the Sonora Lithium Project. We continue to believe that the Sonora Lithium Project has the potential to be a significant producer of battery grade lithium carbonate and will form an important part of the global lithium compound supply chain in the coming years. The board and its strategy have evolved significantly since the Company took a stake in Bacanora four years ago and it will be an increasingly stronger theme with our new investments that we take a more active role in the management of the companies we invest in. The future remains very exciting for the Company. We will continue to support our investee companies and identify new investments – mainly new lithium exploration opportunities – with the potential to be brought into commercial production. Our focus during the period was to continue to develop our investment strategy, that is, to identify, invest and play an active role in the development and progress in assets and companies that have unique access to projects that have the right chemistry, are low cost and represent a value investment. Cadence typically invests at the early stage of the resource development cycle. This can be as early as target delineation and up to scoping study level. The risk associated with investing in any resource projects at an early stage is particularly high within the lithium sector, which is not commoditised and the success or failure of a project is highly dependent on the metallurgical risks. At the period end Cadence owned 16.1% of Bacanora’s equity. On the 7 September Cadence sold approximately 8.90 million of the Company’s shares in Bacanora for gross proceeds of £6.23. Cadence purchased these shares between September 2013 and September 2014 for £3.56 million. The realised gross profit from this sale was £2.67 million, or a 75% realised return on our equity investment. After this sale Cadence owned 9.3% of Bacanora’s equity and a 30% stake in the Mexalit S.A. de CV (“Mexalit”) joint venture which forms part of the Sonora Lithium Project in Northern Mexico. Bacanora’s principal asset is the Sonora Lithium Project in northern Mexico, which completed its preliminary feasibility study (“PFS”) in March 2016. The PFS has an initial targeted production of 17,500 tonnes (t) of lithium carbonate (Li2CO3) per annum, expanding to 35,000 t of Li2CO3 per annum two years later. The PFS has a pre-tax NPV of US$776 million and an IRR of 29%. The PFS mine plan currently has some 16% of the plant feed being mined from the 30% joint venture areas owned by Mexalit. In April, Bacanora entered in into offtake and strategic partnership with Hanwa Co., LTD, a leading Japan-based global trading company and one of the larger traders of battery chemicals in the Asia region. Bacanora has commenced the Feasibility Study (“FS”), which is scheduled for completion in Q4 2017. Bacnanora has also reported that discussions are already underway with long term debt providers with regards to funding for the construction of the lithium operation in Sonora which will allow them to commence the estimated 18 month build programme. Both the equity stake in Bacanora and our ownership in the Mexalit joint venture could represent a substantial return for Cadence in the form of cash flow from the Sonora Lithium Project. To understand the possible outcomes, we have varied the operational costs and revenue per tonne of lithium carbonate to derive a matrix of potential total NPV’s (US$millions) attributable to Cadence from the joint venture and the 9.31% equity stake in Bacanora* as at 07/09/2017. * Company estimates are based on discounted cash flowsfrom both equity and joint venture or direct projectinterests. The Company has used pre- feasibility or scoping studies in the public domain and has estimated the future cash flows that it could receive assuming all free cash flow is distributed to equity and that theproject is entirely equity funded with Cadence retainingits interest and contributing on a pro rata basis. As a result of some small share issues in EMH Cadence now holds a equity stake of 20.4% in EMH, slightly lower than the 20.8% reported in the year end accounts. Through this equity holding we have an economic interest in the Cinovec lithium and tin deposit. The development of this asset has progressed well, with both a 50% upgrade in indicated lithium resources, and a summary of the pre-feasibility study published during the period. The PFS estimated the net present value of the project at US$540m. One of the significant positive aspects of Cinovec is the potential tin credits from any mining operation would assist greatly in keeping the unit costs of lithium in the lowest quartile of global producers. The study and confirmed our analysis of the project in 2015, in that it could represent a low-cost and potentially significant producer of battery grade lithium carbonate for the expanding battery market in Europe. EMH has now commissioned its FS which is scheduled for completion in the second half of 2018. Cadence owns a 30% free carried interest in the Yangibana North, Gossan, Hook , Kanes Gossan, Lions Ear and Bald Hill North rare earth projects (“Yangibana North Project”) in Western Australia. These projects form part of the larger Yangibana Rare Earth Project (“the Project”). The free carry is up to the commencement of the FS. Hastings Technology Metals Ltd (“Hastings”), which is the operator of the Project and the owner of the remaining 70% in the Yangibana North Project, made considerable progress during the year to date. This included upgrading and expanding the mineral resource, lodging mining permit applications and successfully completing the hydromet testing on the ore. Subsequent to the period end Hastings received firm commitments for a A$15.5 million capital raise which will be used for infrastructure works before processing plant construction, in addition Hastongs also three offtake memorandums of understanding for the Projects eventual rare earth products. To assess and publish the potential economic value that Cadence’s stake in the Yangibana North Project, we have asked Hastings to provide both the mine plans and economic models which will form part of the final FS. It is anticipated that once the FS is published we will be able to provide a clear indication of the potential net present value attributable to our interests. Cadence has a 15.7% equity interest in Macarthur, which is an Australian mining exploration company focused on lithium and iron ore, primarily in the Pilbara region of Western Australia. It also has a lithium project in the USA. During the period, Macarthur continued to progress and explore its existing projects and made some further investments in new exploration projects. From its current projects Macarthur reported some anomalous lithium grades in the Nevada brine prospects, discovered further pegmatite swarms and anomalous gold and copper results at its assets in the Pilbara region and also looked to advance its permitted Iron Ore project in the Yilgarn Region of Western Australia. During the period Cadence exercised its options in Macarthur, which increased our shareholding to 20.3%, subsequent to this Macarthur has raised further capital in which we did not participate, which has reduced our ownership to 15.7%. Clancy has a number of exploration licences at the Leogang Cobalt-Nickel Sulphide Project in Austria (the “Leogang Project”). Cadence owns a 10% direct interest in these licenses. In September this year Clancy notified the Company that there were overlapping licenses over 15% of the original license areas. We have agreed with Clancy that we will continue to explore the potential of the Leogang Project and we will work together to identify and acquire additional strategic mineral properties. The management of Cadence continues to liaise closely with and support each of its investee companies. We believe that we have a good spread of investments and joint ventures which diversifies our shareholders’ risks. In addition, we plan to invest some of our profits made from the sale of our equity stake in Bacanora to identify new early stage exploration assets that have the potential to deliver the same level of returns we have seen in our other investments. During the period, the Group made a profit before taxation of £0.90 million (6 months ended 30 June 2016 (restated): profit £6.64 million; year ended 31 December 2016: profit £0.62 million). This was primarily due to the large increase in market value of our available for sale investment in the period ending 6 months ended 30 June 2016, which was not replicated in the current six-month period. There was a weighted basic profit per share of 0.01p (30 June 2016 (restated): profit per share 0.09p, 31 December 2016: profit per share 0.01p). As a result of unrealized foreign exchange differences, comprehensive income for the period was £1.45 million (30 June 2016 (restated): total comprehensive income of £6.50 million, 31 December 2016: total comprehensive expenditure of £0.01 million). Administrative expenses increased by £0.20 million compared to the same period last year, this increase was primarily attributed to payments to outside consultants and legal counsel involved in due diligence and reviews of potential new investments. The total assets of the group increased from £35.45 million at 31 December 2016 to £36.15 million. Of this amount £18.5 million represent the market value of our available for sale investments at the period end. It is important to note that this does not include our investment in EMH. Our investment in EMH is classified as an investment in an associate and held at a value of £12.9 million. EMH is classified as such because we hold in excess of 20% and Kiran Morzaria, the Chief Executive Office of Cadence is also a Non-Executive Director of EMH. During the period, our net cash outflow from operating activities was £1.46 million compared to £1.23 million during the same period last year. The variance is attributable to the increased administrative expenses as highlighted above. We invested a further £0.51 million in assets which brought our net cash position down to £2.13 million. The interim financial statements have been prepared in accordance with applicable accounting standards and under the historical cost convention. The financial information set out in this interim report does not constitute statutory accounts as defined in section 434 of the Companies Act 2006. The Group’s statutory financial statements for the year ended 31 December 2016 have been delivered to the Registrar of Companies. The auditor’s report on those financial statements was unqualified. The principal accounting policies of the Group are consistent with those detailed in the 31 December 2016 financial statements, which are prepared in accordance with International Financial Reporting Standards (IFRSs), as adopted by the European Union. The Directors have prepared cash flow forecasts for the period ending 30 September 2018. The forecasts demonstrate that the Group has sufficient funds to allow it to continue in business for a period of at least twelve months from the date of approval of these financial statements. Accordingly, the accounts have been prepared on a going concern basis. Estimates and judgements are continually evaluated and are based on historical experience and other factors, including expectations of future events that are believed to be reasonable under the circumstances. An operating segment is a distinguishable component of the Group that engages in business activities from which it may earn revenues and incur expenses, whose operating results are regularly reviewed by the Group’s chief operating decision maker to make decisions about the allocation of resources and assessment of performance and about which discrete financial information is available. The chief operating decision maker reviews financial information for and makes decisions about the Group’s performance as a whole. The Group has not actively traded during the period. Subject to further acquisitions the Group expects to further review its segmental information during the forthcoming financial year. The calculation of the profit per share is based on the profit attributable to ordinary shareholders divided by the weighted average number of shares in issue during the period. Cadence Minerals announces that notice of the Annual General Meeting of the Company, to be held at 11 am on 29 August 2017 at the offices of Hill Dickinson LLP, The Broadgate Tower, 8th Floor, 20 Primrose Street, London, EC2A 2EW, has been posted today. The Notice of AGM will shortly be available online at www.cadenceminerals.com . Cadence Minerals Plc (AIM/NEX: KDNC; OTC: KDNCY) has today exercised its remaining 7,500,000 warrants in Macarthur Minerals Limited at an exercise price of CAD$0.05, for a total consideration of CAD$375,000. This exercise of warrants will increase Cadence’s interest in Macarthur Minerals to 20.3%. Cadence is dedicated to smart investments for a greener world. The planet needs rechargeable batteries on a global scale – upcoming supersized passenger vehicles, lorries and buses – require lithium and other technology minerals to power their cells. Cadence is helping find these minerals in new places and extracting them in new ways, which will meet the demand of this burgeoning market. With over £40 million vested in key assets globally, Cadence is helping us reach tomorrow, today.